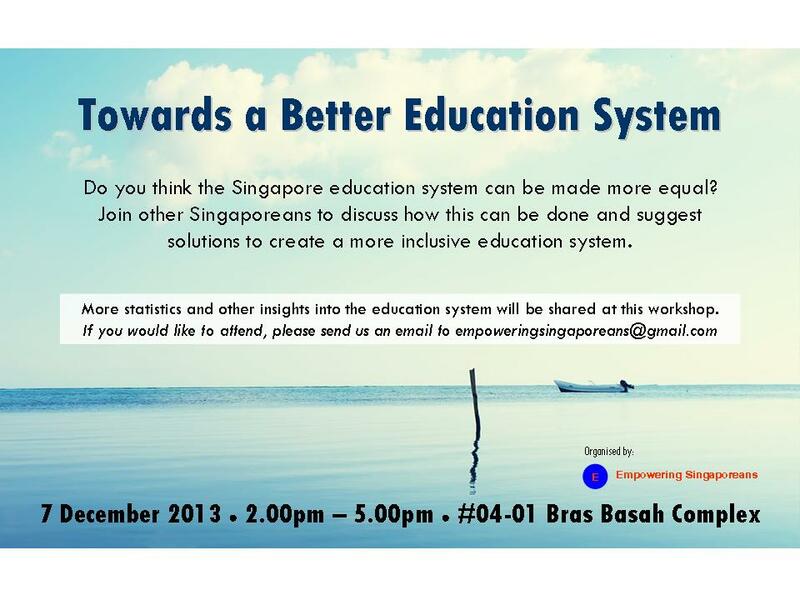 In the previous article, I had discussed if the government has planned for the education system to prepare adequately for Singapore’s economy. 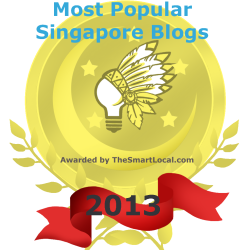 In this article, I will zoom down to a specific issue – on the readiness of the education system to prepare for the healthcare needs in Singapore. Singapore has the lowest number of physicians per 10,000 population among the developed countries. Singapore is training one of the lowest number of medical graduates per 100,000 population among the high-income countries. Is the reason why we have the lowest number of physicians because the PAP government spends the lowest % of GDP on health, as compared to the other developed countries, and one of the lowest in the world? Is the reason why we have one of the lowest number of medical graduates because the PAP government spends the lowest % of GDP on education, as compared to the other high-income countries? Why does the PAP government spend the lowest on health and education even though Singapore is one of the richest countries, by GDP per capita, in the world? I am not quite sure what the MOE means when they said that they would want to “ensure a good spread of talent”. 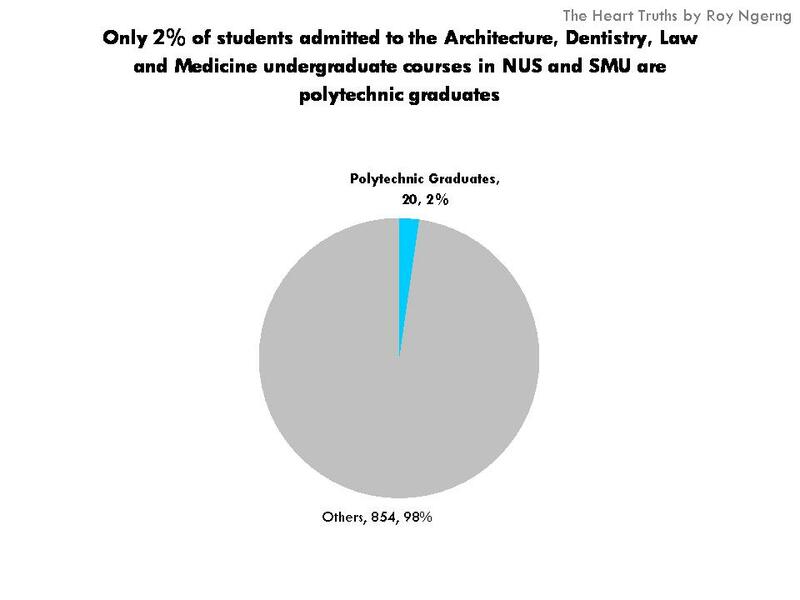 Two weeks ago, I had written about how, of the students who were able to enter the Architecture, Dentistry, Law and Medicine courses at the National University of Singapore (NUS) and the Singapore Management University of Singapore (SMU), only 2% were polytechnic graduates (Chart 1). I would be interested to understand why the MOE does not believe that the Medicine (and other) faculty would benefit from a “good spread of talent” from the polytechnic graduates. Currently, the two medicine schools (NUS and the Nanyang Technological University of Singapore (NTU)) in Singapore has enrolled only 354 students in 2013. But is this enough? 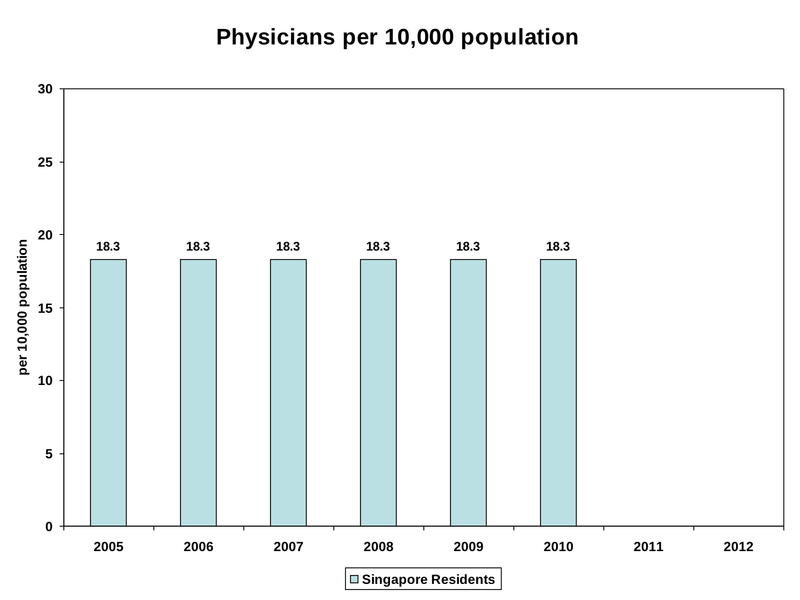 According to the World Health Organisation, the number of physicians per 10,000 in Singapore had remained at a constant low at 18.3 (Chart 2). 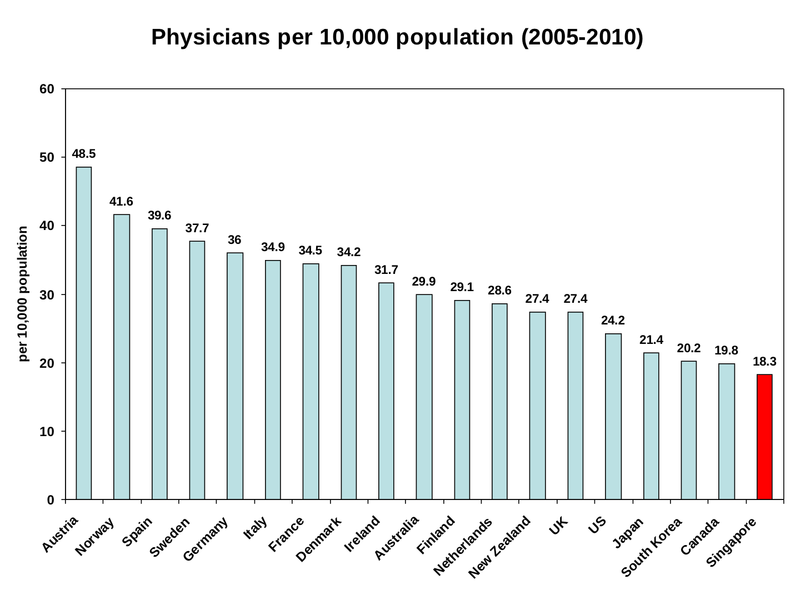 Not only that, compared with the other developed countries, Singapore also has the lowest number of physicians per 10,000 population (Chart 3). Thus does Singapore have a shortage of doctors? Doesn’t this mean that the MOE and MOH are severely under-projecting “the demand for medical manpower”? And is the PAP government not opening up enough spaces in our universities to train more doctors for the growing needs of our ageing population? 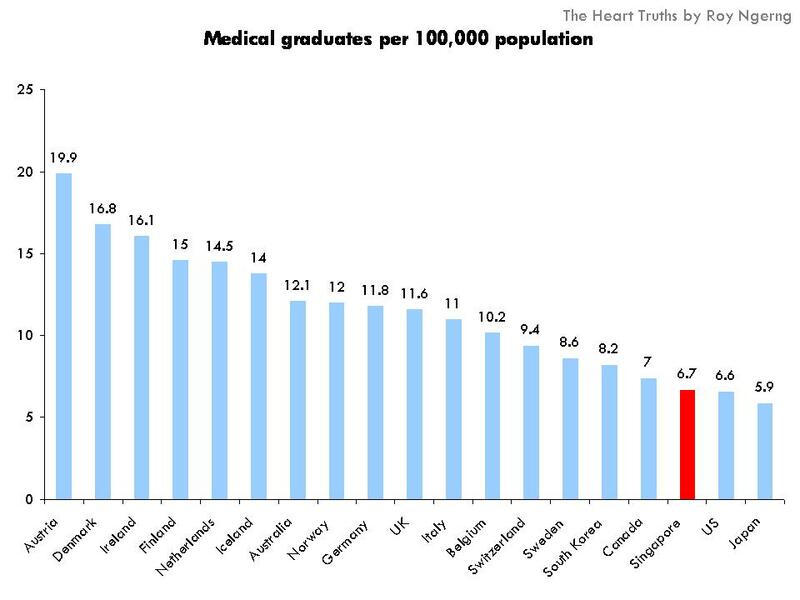 Indeed, when compared with the other countries, Singapore produces the second lowest number of medical graduates per 100,000 population, after the United States (Chart 4) (Singapore’s figure is derived from the number of medical graduates of 354 divided by 53.124, or the total Singapore population of 5,312,400 divided by 100,000). Thus it is sufficiently clear that the reason why there are a shortage of doctors in Singapore is because of the low enrollment of medical students into our universities. The question to ask is, why has the PAP government severely under-projected the number of doctors and medical students sorely needed in Singapore’s healthcare system? Already, we are hearing of stories where because there are not enough doctors and healthcare facilities, that there have been cases where people would have to wait for months before they are able to make an appointment, or to wait at the Accident & Emergency department for many hours before they are attended to. There have also been cases where patients have died and where their families have attributed it to the lack of care at the hospitals. Or when doctors have been so busy that the care was forced to be slipshod, such that patients had been wrongly diagnosed, or that not enough care was given and patients had to returned to the hospital. But this is only the tip of the iceberg. There have been many cases where people have to sell their homes to pay for healthcare. There have also been many unreported cases where patients choose to postpone care because they are too poor to seek medical assistance, and end up developing chronic illnesses, which require even more expensive care and treatment. But why does all this have to happen? 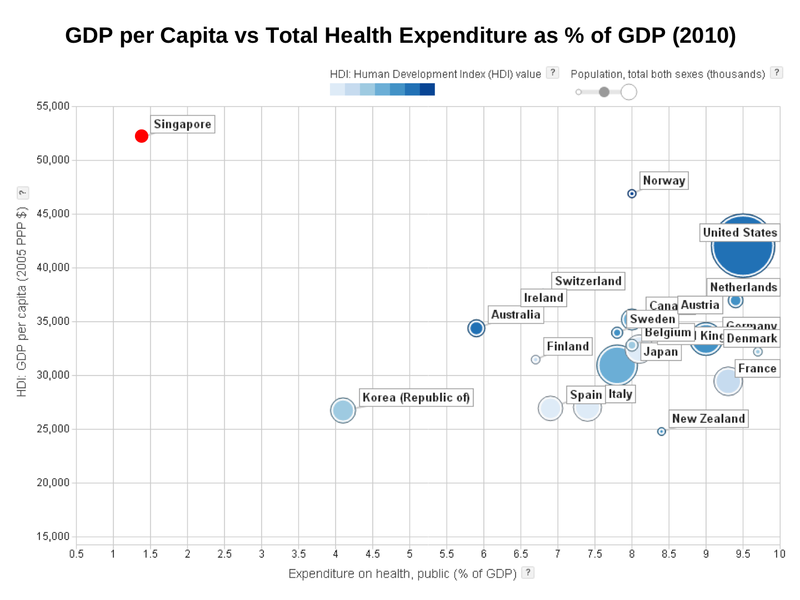 Because the PAP government spends the lowest on health, as compared to the other high-income countries (Chart 5). In fact, Singapore is one of the richest countries in the world but the PAP government stings the most on health, as compared to the other high-income countries (Chart 6). And why are we not training enough doctors? 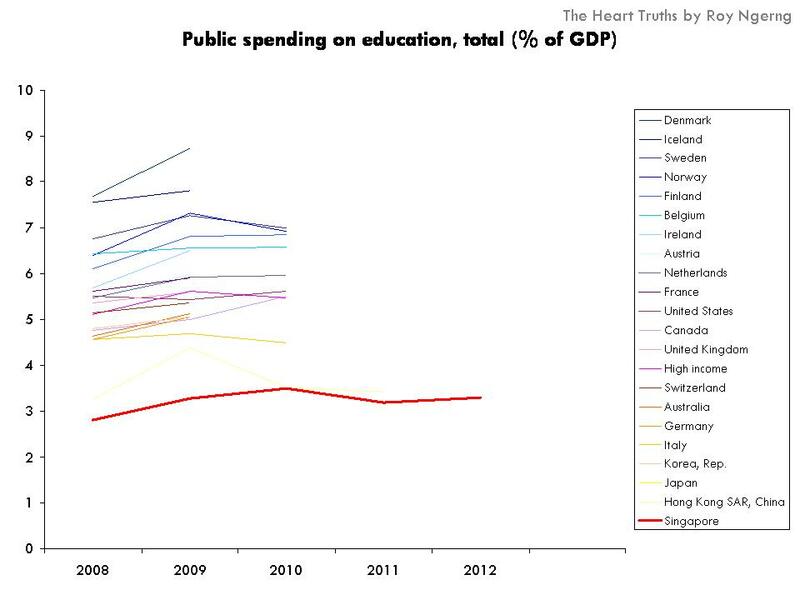 Because the PAP government spends the lowest on education (Chart 7). And the government sets an artificial limit on the number of doctors to be trained – which is way below the level required. Evidently, the PAP government is severely underspending on healthcare and education – the long term implications are such that on a structural level, our health system will have a chronic shortage of doctors and healthcare facilities. Singaporeans will also not be able to receive the adequate care required. 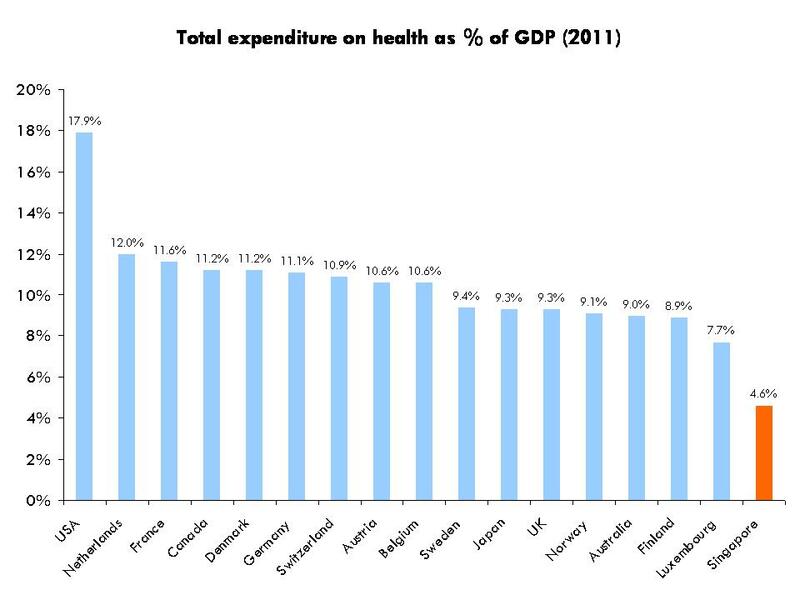 Already, the government spends only 31% on health, out of the total health expenditure. 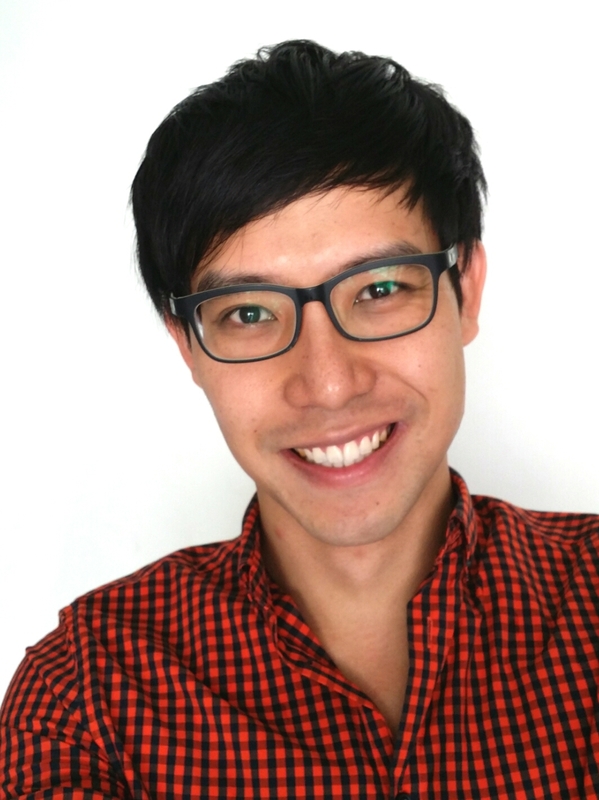 This has led to unequal access and health outcomes, where the poor are made to spend a higher proportion of their incomes on health, and because 40% of Singaporeans cannot afford to buy private health insurance, for the 40% of the Singaporeans who fall into the low-income or lower-middle-income bracket, their inability to seek adequate medical support can create a further burden on our health system. It has been known that, “as countries become more developed and wealthier, they devote more public resources to health and spend proportionately more on health per capita“, so why is does the PAP government choose to buck the trend? Also, low government expenditure on health has also been associated with a health system that is “extremely inequitable” and where there is a “lack of social safety nets and limited or no financial protection to the majority of people”, which can lead to a “high prevalence of poverty due to catastrophic health expenditure”, as is the case in Singapore, where an estimated 28% of Singaporeans are living in poverty – the highest among the high-income countries and even compared to countries in the region. So, does Singapore need to spend more on education to train more doctors for the health system? Does Singapore need to spend more on health to increase the number of doctors and healthcare facilities for the growing population? I think the answer in an unequivocal yes. However, the question is – does the PAP have the will to see these changes happen. Or, rather, is it not in the PAP’s interest to increase spending in these areas which they perceive as not contributing to the economy? Nice charts. Can you include Malaysia, Indonesia, Thailand, Vietnam, Korea and other Asian countries to put things further into perspective? While we benchmark ourselves to Western countries, we should benchmark ourselves to our neighbours. I mean we are in Asia right?